Doug was born in Central Indiana, so is it any wonder he grew up as a fan of motorsport? Even his favourite toys during childhood reflect this passion as his prized Matchbox car was a Can Am Porsche 917. Oh why oh why was he ever allowed to take that precious collectable out of the packaging and actually play with it? He made his first visit to the Indianapolis Motor Speedway in 1977 in the summer after A.J. Foyt won his history-making fourth Indianapolis 500 Mile Race victory, and has been watching the 500 from Stand J since 2000. Although he remains an IndyCar fan to this day, he is a fan of all motorsports from RedBull Air Racing, to rally racing, and even swamp buggy racing if he can find a YouTube feed. 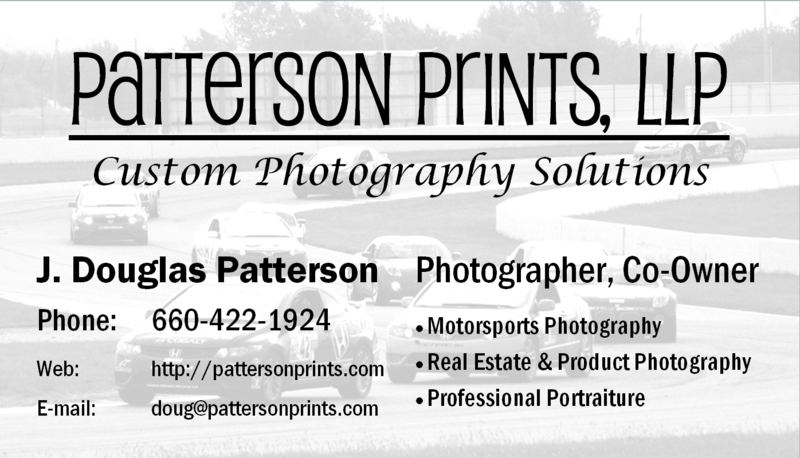 He rediscovered a passion for photography at the 2008 MotoGP race at Indianapolis and has been photographing IndyCar, ALMS, Grand Am, SCCA, and Rally America events ever since. In 2012, after far too many decades simply watching motor car racing from the stands, Doug joined the SCCA and started competing in Solo, Road Rally, and RallyCross events in the Kansas City Region. When not at the track, Doug teaches astronomy and physics at Johnson County Community College in Overland Park, KS, does space physics research for Fundamental Technologies in Lawrence, KS, serves as Associate Editor and Photographer at Formula1Blog.com, and helps his wife, Tabatha, run their photography business, Patterson Prints, LLP.